I spent this week at the Carl Sagan Summer Workshop, which was on transiting planets this year. The workshop was a mix of pedagogical lectures, hands-on modeling exercises, and short talks by workshop attendees. During one of the lectures, I was introduced to a paper published in 2011 (and posted to the arxiv in 2010) that presented a unique system. Although not related to exoplanets, it immediately caught my interest, and I wanted to share them with any of you who may also have missed this neat result! V1309 Sco first caught astronomers’ attention in 2008, when it displayed an outburst, suddenly getting a hundred times brighter. It was an example of a “nova,” a catch-all term for stars that get really bright all of a sudden, without being destroyed in the process. (If the star is destroyed, leaving behind a stellar remnant, it’s called a supernova. Supernovae are bright enough to be seen in distant galaxies.) But V1309 Sco wasn’t a typical nova – called a “classical nova” – which are the result of matter falling onto a white dwarf from a close companion star, igniting hydrogen fusion. V1309 Sco had a complex spectrum which varied rapidly in time and produced an expanding shell of material that expanded at only 150 km/s, or more than 300,000 miles per hour (that seems pretty fast, but classical novae expel shells at a few thousands of km/s). The explosion was interesting in its own right, but what really caught the attention of the audience at the Sagan Workshop was what happened before the explosion. It turns out that, due its location near the Galactic center, V1309 Sco has been monitored by the OGLE Project, which is looking for microlensing events (see this astrobite for more information). OGLE took more than 2000 observations of this object, obtained regularly from 2001 to 2009. The authors of this paper were able to look back into this archive of data and see what V1309 Sco was doing before it erupted. Left: the evolution of the period of V1309 Sco over several years. The x-axis shows time and the y-axis shows the period of the light curve variations, in days. This plot shows the period of the variations decreasing with time. Right: light curves of V1309 Sco from 2002-2006 (from top to bottom). On the right, you can see that the shape of the light curve variability is changing. The change in period that was shown on the left-hand plot is too small to see by eye here. The x-axis shows the phase and the y-axis the brightness (the light curves from different years have been offset from one another). The figure above and right shows the light curves from 2002 to 2006 (top to bottom). You can see the periodic variations in brightness, and the change in the shape of the light curve from season to season. This is most evident when looking at the light curve from 2006: instead of equal magnitude variations, the first peak is higher than the next. Above and left, you can see that the period of variability has also been changing with time: over 5 years, the period decreased by 0.02 days. The authors consider three scenarios to explain the variability in the light curves shown above: stellar pulsation, the rotation of a single star, and an eclipsing binary. Stellar pulsation is ruled out because we don’t know of any pulsating stars that have sizes and temperatures matching those of V1309 Sco. There’s also no known way to have pulsations produce the outburst seen in 2008. Rotation is more likely; in this case, the periodic brightness variation would be due to star spots rotating in and out of view. However, the star would have to be rotating pretty quickly (with a period of 1.4 days) and the star spots would have to remain in roughly the same location on the star over 5 years. For comparison, spots on the Sun last weeks, not years, and rapid rotation is expected to destabilize spots, not keep them around for longer. The explanation that’s left is that of an eclipsing contact binary system (“contact” means that the stars are so close to each other that their atmospheres form one common envelope. A free, interactive demo can be found here.) This explains the periodic behavior of the light curve: the stars pass in front of each other, blocking out some of the light each time around. It also explains the decreasing period: the two stars are getting closer together and so, by Kepler’s 3rd law, their orbital period shrinks. And the 2008 eruption, how does that fit into the binary system scenario? That’s the two stars merging together. The merging of the two stars released a lot of energy, producing the bright outburst that first brought attention to V1309 Sco. A single star was left behind after the outburst, which has been gradually cooling since. The full light curve, from 2001 to 2010, is shown in the figure below. Although predicted by theory and generally expected, this is the first direct evidence that contact binaries merge to form a single star. 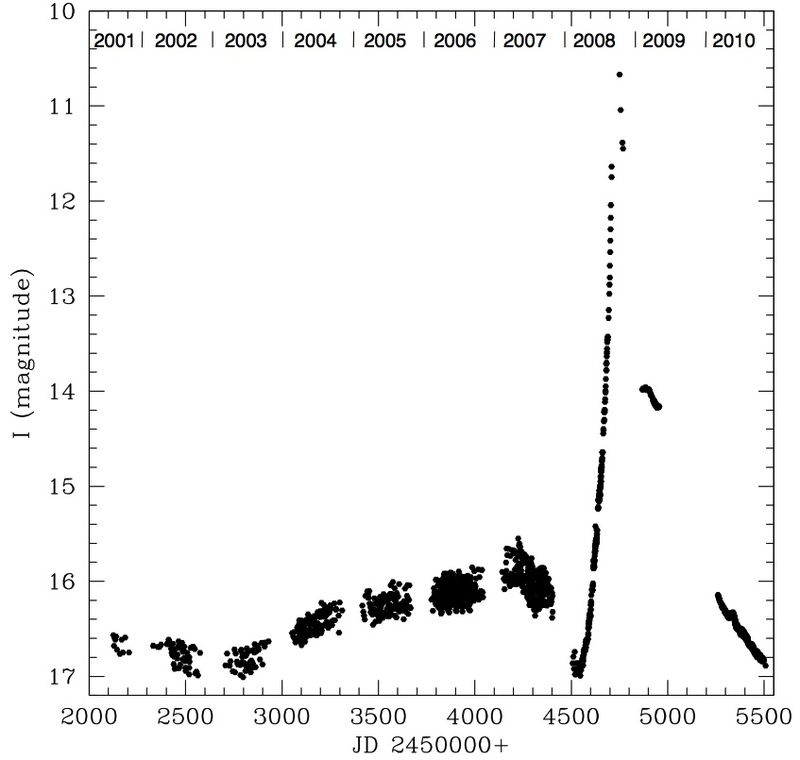 The light curve of V1309 Sco, from 2001 to 2010. The x-axis shows time and the y-axis shows brightness. I am an NSF Astronomy & Astrophysics postdoctoral fellow at MIT. I was a Harvard graduate student and an astrobites and ComSciCon co-founder. M Dwarfs Are Not Passé Astronomers like Easter egg hunts: studying a unique star system in the infrared And now there’s a problem with M dwarfs, too A star with a fake ID? How close is V1309 Scorpii to us in light years? Couldn’t find the info on Wikipedia.